Some call it "soda." Otheres call it "pop." A few crazy people combine the two and call it "soda pop." Whatever you call it, it's horrible for me and I love it. It seems in the midwest (or at least around here) it is more common than it was in Florida for people to be walking around with gigantic styrofoam cups filled with the deliciousness. While living in Florida there were a few times that I would induldge in a soda twice the size of my bladder while at work and it seemed every time someone would comment on it. I'd use the excuse that it is a staple to survive in my profession or that since I don't drink coffee it was my substitute. In 8th grade I gave up drinking soda. I swore it off. I told myself that I wasn't going to allow myself to drink the stuff. I went almost 3 years without drinking a single soda. I treated it like an alcoholic treats alcohol. I wouldn't allow myself even a sip. I was much healthier and felt a lot better about myself. I'm not sure how/when exactly I was convinced to give in, but I did. It started with drinking Sprite or some other clear soda. I remember the first taste and how it burnt my throat and my nostrils. I couldn't believe people actually enjoyed drinking it...and then I became one of those people. Given the opportunity I would drink an entire 2 liter in a single day. I don't drink soda often, but if I know it is available I drink like crazy. I'll go through 4 or 5 refills at a restaurant without even batting an eye. I once had a waitress bring me two glasses because I drank so fast. On the way to work this morning I thought to myself, "If you could do it in 8th grade; you can do it now." I'm not setting a period of time for how long I want to give it up. What I'm wanting to do is just wake up each day and tell myself "today, I'm not drinking soda." Taking it one day at a time and see how long it continues. I think your issue is more that we don't keep soda in the house... therefore when you do have it you feel the need to drink a ton in order to hold you over until the next time you have some. 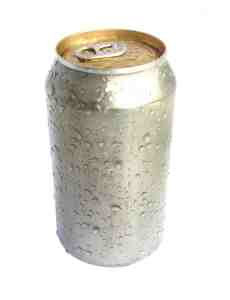 If you had some in the house and had a can of it 2-3 times a week you wouldn't drink so much while we were out.